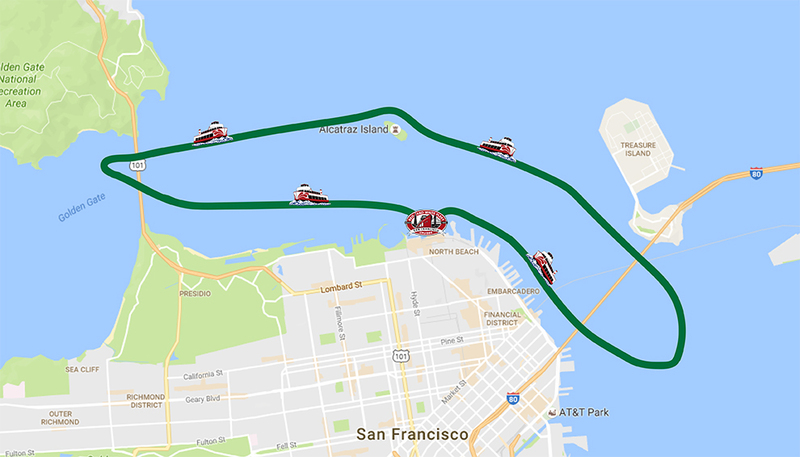 On select dates in December, the Red and White Fleet 4:15PM Bridge 2 Bridge Cruise, will transform into the Red, White and Green Fleet! This exclusive family offering during the month of December includes a special appearance from Santa, a massive lit up Rudolph nose on the bow of the vessel, free Santa hats, giveaways, games, holiday themed drinks, and more! Bring the family, take in the sights and enjoy some holiday cheer out on the Bay! Boarding photo with Santa – photo will be sold on the dock upon return of the cruise. Lit up Rudolph nose on the bow of the vessel. Free Santa hats for all guests. Holiday bingo game for kids. Tickets selling fast! Limited capacity. Book today! Children ages 4 and under receive complimentary admission to Red and White Fleet cruises but need to be ticketed for capacity control.